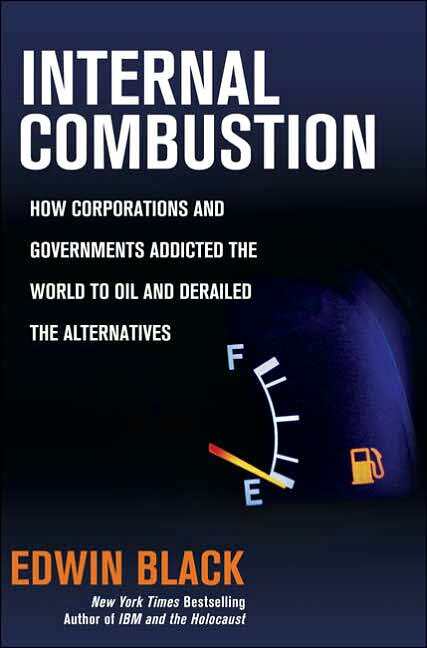 Mr. Black is the author of the award-winning IBM and the Holocaust and the recently published Internal Combustion: How Corporations and Governments Addicted the World to Oil and Derailed the Alternatives. Click here for his website. Click here for Part 2. And here for Part 3. And here for Part 4. Just the day before, May 1, 1934, under a brilliant, cloudless sky, Mooney, president of the General Motors Overseas Corporation, climbed into his automobile and drove toward Tempelhof Field at the outskirts of Berlin to attend yet another hypnotic Nazi extravaganza. This one was the annual "May Day" festival. General Motors World, the company house organ, covered the May Day event glowingly in a several-page cover story, stressing Hitler´s boundless affinity for children. "By nine, the streets were full of people waiting to see Herr Hitler go meet the children," the publication reported. For GM´s part, the company has repeatedly declined to comment when approached by this reporter. It has also steadfastly denied for decades — even in the halls of Congress — that it actively assisted the Nazi war effort or that it simultaneously subverted mass transit in the United States. It has also argued that its subsidiary was seized by the Reich during the war. The company even sponsored an eminent historian to investigate, and he later in his own book disputed many earlier findings about GM´s complicity with the Nazis. In that book, he concluded that assertions that GM had collaborated with the Nazis even after the United States and Germany were at war "have proved groundless." In fact, just two months before Mooney´s meeting at the Chancellery, Hitler had commented at the Berlin International Automobile and Motor Cycle Show: "It can only be said with profound sadness that, in the present age of civilization, the ordinary hard-working citizen is still unable to afford a car, a means of up-to-date transport and a source of enjoyment in the leisure hours." Even if few Germans could afford cars — GM or otherwise — the company did provide many in the Third Reich with jobs. Hitler was keenly aware that GM, unlike German carmakers, used mass production techniques pioneered in Detroit, so-called "Fordism" or "American production." Mooney told Hitler that GM was willing to mass produce a cheap car, costing just 1,400 marks, with the mass appeal of Henry Ford´s Model T, if the Nazi regime could guarantee 100,000 car sales annually, issue a decree limiting dealer commissions and control the price of raw materials. Many automotive concerns were vying for the chance to build Hitler´s dream, a people´s car or "volkswagen," but GM was convinced it alone possessed the proven production know-how. An excited Hitler showered his GM guests with many questions. The next morning, May 3, 1934, an excited Hitler told Keppler, "I have been thinking all night about the many things that these Opel men told me." He instructed Keppler, "Get in touch with them before they leave Berlin." Hitler wanted to know still more. Mooney spent hours later that day ensconced in his hotel suite composing written answers to the Fuhrer´s many additional questions. A few weeks after the prolonged Chancellery session, the company publication, General Motors World, effusively recounted the meeting, proclaiming, "Hitler is a strong man, well fitted to lead the German people out of their former economic distress... He is leading them, not by force or fear, but by intelligent planning and execution of fundamentally sound principles of government." Typical of news coverage of events at the time was an article in the March 26, 1933, edition of The New York Times, headlined "Hitler a Menace." The article, quoting former Princeton University President John Hibben, echoed the war fear spreading across both sides of the Atlantic. "Adolf Hitler is a menace to the world´s peace, and if his policies bring war to Europe, the United States cannot escape participating," the article opened. This was one of dozens of such articles that ran in American newspapers of the day, complemented by continuous radio and newsreel coverage in the same vein. "Deliberately to stop growing is to suffocate," Sloan wrote in his 1964 autobiography about his years at GM. "We do things in a big way in the United States. I have always believed in planning big, and I have always discovered after the fact that, if anything, we didn´t plan big enough. I put no ceiling on progress." In a 1934 letter to Roosevelt´s Industrial Advisory Board, Sloan complained bitterly that the New Deal was attempting to change the rules of business so "government and not industry [shall] constitute the final authority." In Sloan´s view, GM was bigger than mere governments, and its corporate executives were vastly more suited to decision-making than "politicians" and bureaucrats who he felt were profoundly unqualified to run the country. Government officials, Sloan believed, merely catered to voters and prospered from backroom deals. Indeed, Sloan felt that GM could — and should — create its own foreign policy, and back the Hitler regime even as America recoiled from it. "Industry must assume the role of enlightened industrial statesmanship," Sloan declared in an April 1936 quarterly report to GM stockholders. "It can no longer confine its responsibilities to the mere physical production and distribution of goods and services. It must aggressively move forward and attune its thinking and its policies toward advancing the interest of the community at large, from which it receives a most valuable franchise." When explaining his ideas of mass production to Opel car dealers, Sloan proudly declared what the enterprise would mean: "The motor car contributes more to the wealth of the United States than agriculture. The automobile industry is a wealth-creating industry." What was true in America would become true in Germany. Ironically, GM chose the alliance with Hitler even though doing so threatened to imperil GM at home. Just days after Hitler came to power on Jan. 30, 1933, a worldwide anti-Nazi boycott erupted, led by the American Jewish Congress, the Jewish War Veterans and a coalition of anti-fascist, pro-labor, interfaith and American patriotic groups. Their objective was to fracture the German economy, not resurrect it. This article was first published by the JTA. Copyright by Edwin Black. So that's the story behind GM and Hitler. Few decades after that took place, many things changes but still is affected by it. General Motors is now one of the top makers of quality vehicles and parts like GM thermostat. And is competiting closely with German Automakers like Volkswagen. Well, Edwin Black is not the soberest of scholars, of course-- in many respects, he reminds me of David Noble. He has rather overstated his case. However, there is a grain of truth within his argument. For example, back in the late nineteenth and early twentieth century, there were what were called Interurban Railroads, essentially long-distance streetcars running between towns. Continuous Interurban networks ran across large sections of the Midwest. They were not built to the same standard of construction as a mainline electric railroad, and they did not do long distance express trains or heavy freight. The automobile companies did do things like buying up streetcar companies and converting them to motor buses, but in fairness, the streetcar companies were part of the electrical industry, ultimately backed up by firms such as General Electric and Westinghouse, and the electrical industry played by the same hardball rules, eg. the Selden Patent. They had their own racket, in short. Electric motors have two big comparative advantages over the internal combustion engine. One is that they do not produce smoke, which makes them useful in tunnels. The other advantage is that electric motors have a lot of burst power, for climbing hills, and accelerating rapidly. Electricity shines either where it is necessary to go underground, or in mountains. Of course, mountains often pose the necessity for tunnels. The northwestern railroads, those running from Minneapolis to Seattle, viz, the Northern Pacific, the Great Northern, and the Milwaukee Road (the Chicago, Milwaukee, St. Paul and Pacific Railroad), had to go through the worst part of the Rockies, and then through the Cascades. They dug themselves some long tunnels, most notably the Cascade tunnel, and they build some tracks leading up steep grades. Two of the three, the Great Northern and the Milwaukee Road, employed electric locomotives, not over their whole length, but over the difficult portions of their lines where electrics gave special advantages. When they eventually switched to diesel, it was in the context of cutbacks and cost reductions, at a time when the airlines were eviscerating the railroads' most upscale services. The capacity of the major tunnels is limited by smoke considerations, and in some tunnels, the train crews are required to don gas masks before entering. The other notable electric railroad in the United States is of course the Northeast Corridor, together with its multiplicity of connected commuter railroads, many of them electric. Now, as to economics, the progress of the automobile, aviation, and petroleum industries in the twentieth century is obviously linked to the military-industrial complex. By 1960, American railroads were economically moribund. Apart from the case of Europe, Russian, Swedish, Indian, South African, and Chilean railroad practice suggests that the United States could have gone a lot further with electrified railroads, if they had been made a priority. "At the same time, sooty diesel locomotives replaced the all-electric trains that crisscrossed the country and easily glided over the Rocky Mountains." how can such a historically ignorant statement be ignored when judging black's overall veracity?